On Tuesday June 19th 2018, Director of the SVG Preservation Fund, Louise Mitchell handed over a cheque of EC$54,000.00 to Hon Saboto Caesar, Minister of Fisheries, as part of a Fisheries Division project to compensate former turtle fishers who hand in their turtle nets. 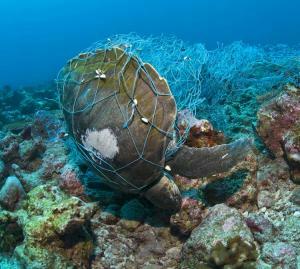 The de-commissioning of the nets is a symbol of willingness to comply with the new legislation banning the hunting of sea turtles. At the ceremony, Louise Mitchell spoke and she recognized the fishers for their role in compliance with the new law. She stated that its the fishers are key players in ensuring the protection of sea turtles and she thanked them for embracing conservation of the threatened sea turtles. Hon Minister Caesar spoke about the great livelihood that could be had from taking persons to see turtles using a glass bottom boat, relating his experience in the BVI where he attended a mission to share the SVG experience in adopting the total protection of sea turtles. The former turtle fishers received compensation based on the value of the nets that were handed in. The Chief Fisheries Officer Mrs Jennifer Cruickshank- Howard indicated that she expects that they will use these funds to help them get a start in an alternative livelihood, such as fishing. She further stated that training would be provided to the former turtle fishers in alternative livelihoods.